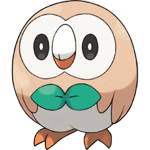 Rowlet is the seven-hundred-and-twenty-second Pokemon on the National Pokedex and was introduced in Generation 7 (Sun & Moon). Rowlet is a Grass/Flying type Pokemon. 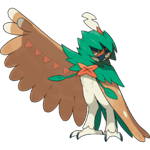 It is a Basic Pokemon that evolves into Dartrix at level 17 which evolves into Decidueye at level 34. 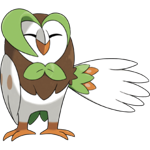 Rowlet is one of three starter Pokemon in Alola, alongside Litten and Popplio.